Grace Time (a grace-filled time) is our time between Sunday morning worship services, when all can participate in the variety of activities offered throughout the church, for all ages, all interests. Grace Time is for connecting with others, soul-filling fun, and digging deeper into conversations and Biblical study. All choirs are for anyone interested – no experience necessary. Coffee is always on! 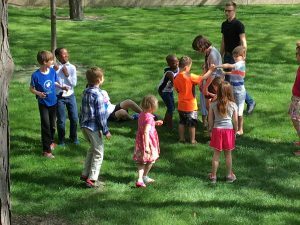 Children gather on the north lawn for music and games on a Second Sunday. Occasional book studies for parents and children – Books & Bagels – are held off site at Bruegger’s on Washington. Books announced 1-2 months ahead.